Max Robinson (May 1, 1939 – December 20, 1988) was an American broadcast journalist, and ABC News World News Tonight co-anchor. He was the first African-American broadcast network news anchor in the United States and one of the first television journalists to die of AIDS. He was a founder of the National Association of Black Journalists. Robinson was born to Maxie and Doris Robinson in Richmond, Virginia, and went on to attend Oberlin College, where he was freshman class president. He briefly served in the United States Air Force and was assigned to the Russian Language School at Indiana University before receiving a medical discharge. He began working in radio early on, including a short time at WSSV-AM in Petersburg, Virginia, where he called himself “Max The Player,” and later at WANT-AM, Richmond. Robinson began his television career in 1959, when he was hired for a news job at WTOV-TV in Portsmouth, Virginia. He had to read the news while hidden behind a slide of the station’s logo. One night, Robinson had the slide removed, and was fired the next day. He later went to WRC-TV in Washington, DC, and stayed for three years, winning six journalism awards for coverage of civil-rights events such as the riots that followed the 1968 assassination of Dr. Martin Luther King, Jr. It was during this time that Robinson won two regional Emmys for a documentary he made on black life in Anacostia entitled The Other Washington. In 1969, Robinson joined the Eyewitness News team at WTOP-TV (now WUSA-TV) in Washington, D.C. 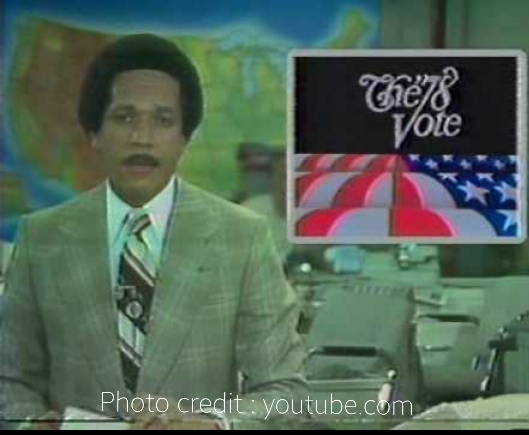 He was teamed with anchor Gordon Peterson, becoming the first African-American anchor on a local television news program, and the newscast took off. During that time, he was so well-liked by viewers that when Hanafi Muslims took hostages at the B’nai B’rith building in Washington they would speak only with Robinson. In 1978, when Roone Arledge was looking to revamp ABC News’ nightly news broadcast into World News Tonight, he remembered Robinson from a 60 Minutes interview, and hired him to be a part of his new three-anchor format. Robinson would anchor national news from Chicago, while Peter Jennings would anchor international news in London and Frank Reynolds would be the main anchor from Washington. Robinson thus became the first black man to anchor a nightly network news broadcast. The three-man co-anchor team was a ratings success, and launched spoofs regarding how the three would pitch stories to each other during the telecast by saying the other’s name: “Frank”…”Max”….”Peter,” etc. Robinson’s ABC tenure was marked by conflicts between himself and the management of ABC News over viewpoints and the portrayal of Black America in the news. In addition, he was known by his co-workers to show up late for work or sometimes not show up at all, along with his moods, and his use of alcohol escalated. In addition, Robinson was known to fight racism at any turn and often felt unworthy of the admiration he received and was not pleased with what he had accomplished. Together with Bob Strickland, Robinson established a program for mentoring young black broadcast journalists. During most of Robinson’s tenure, ABC News used the Westar satellite to feed Robinson’s segment of WNT from Chicago to New York. TVRO receiver earth stations were also coming into use at the time, and anyone who knew where to find the satellite feeds could view the feed. On the live feed, Robinson could be seen to have a drink or two, but never during the actual aired segment, which led some bars around the country to even have drink specials during the nearly 90 minutes, and inviting patrons to come in and see the “Max ‘R'” feed. ABC eventually caught on to what was happening, and even resorted to hide what was going on by supering a slide with the words “ABC News Chicago” on the screen during the live feed during times that Robinson was not live over the actual WNT broadcast. In addition, Robinson could often be seen being harsh towards those who worked around him during the live feed. Reynolds died in 1983, and shortly afterward Jennings was named sole anchor of World News Tonight. Robinson was relegated to the weekend anchor post, as well as reading hourly news briefs. He left ABC in 1984 to become the first black anchor at WMAQ-TV in Chicago. He retired in 1985. Max Robinson was married three times. Two ended in divorce, one in annulment. His first marriage was to Eleanor Booker and they had three children: Mark, Maureen and Michael. His second marriage was to Hazel O’Leary. His final marriage was to Beverly Hamilton, with whom he had another son, Malik. Robinson was found to have AIDS while he was hospitalized for pneumonia in Illinois, but he kept it a secret. In the fall of 1988, Robinson was in Washington to deliver a speech at Howard University’s School of Communications when he became increasingly ill. Robinson checked himself into Howard University Hospital, where he died of complications due to AIDS on December 20, 1988. Robinson denied being gay or bisexual. At his service, he was eulogized by the Rev. Jesse Jackson. He was a brother to Randall Robinson.